Although that may sound like a silly question, the variety of answers is fascinating. We can consider its behaviors. What is it doing? What is it used for? We can consider its systems. What parts make up the whole? Of what bigger structures is it a component part? We can consider its direction. Where did it come from? Where is it going? We can consider its potential. Just like how physical objects are actually overlapping clouds of quantum probability, what possible states or outcomes describe it now or wait in its future? From all four of these different perspectives we can look at the tree in two ways: from the point of view of an external observer, or what answers the tree itself might provide if it could reply. Time for a second question. What are our math topics? We can consider them in all the same ways. In this class we start in the beginning. What are our math topics doing, from their own perspective? The topics would say they are about patterns that have turned into formulas. What does that mean? Where do formulas come from? How are they invented? Why do they work? How do they make sense? All those questions have the same answer: patterns. 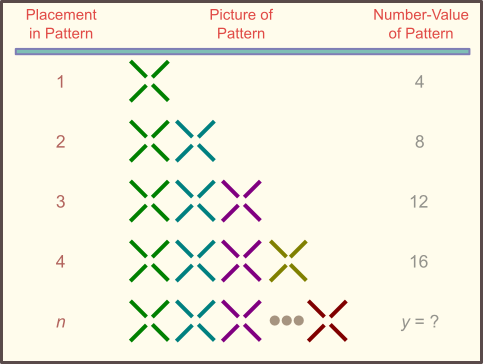 The easiest way to watch patterns become formulas is to make a table. 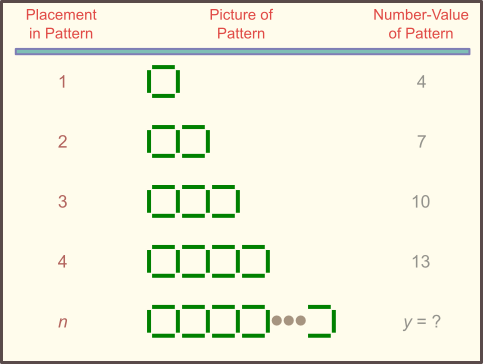 In each row put which place in the pattern we are at, what the pattern looks like, and the number-value for that place. 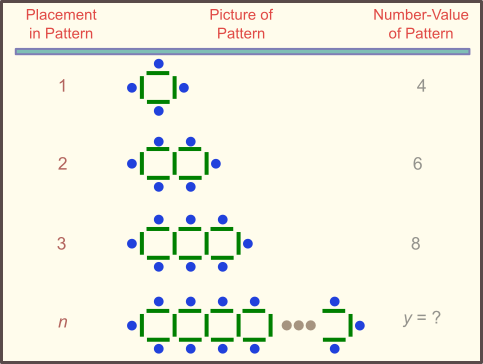 We can then look at the table to analyze the pattern and create a formula. 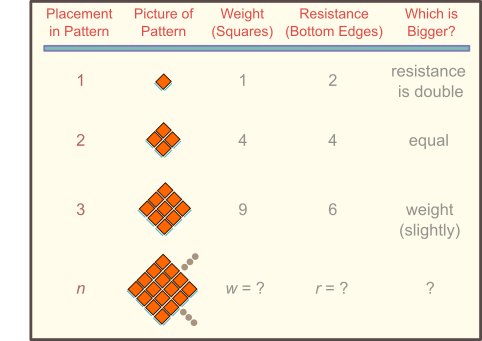 Here are a few patterns to analyze and turn into formulas. This activity is our "icebreaker" activity as the new term begins, to help you meet your classmates. Work on each pattern with a different partner, and introduce yourselves as you work quietly together. 1. This pattern is an increasing number of X shapes, each made by four toothpicks. Can you explain the formula that describes how many toothpicks it takes to make a row of X shapes? 1. Each row adds four toothpicks. The pattern is y = n × 4. By the way, we use n as the formula's input letter instead of x because of tradition. Using n shows that only "normal" counting numbers are inputs—never fractions, decimals, or negative numbers. A formula with x would allow those. 2. Can you explain the formula that describes how many toothpicks it takes to make a row of boxes? 2. Each row adds three toothpicks in a C shape, and there is always one extra toothpick at the far right edge to close the right-most box. The pattern is y = (3 × n) + 1. Notice that we do not need the parenthesis. The order of operations for arithmetic already has us multiply before adding. But the parenthesis do help communicate where the pattern came from. 3. 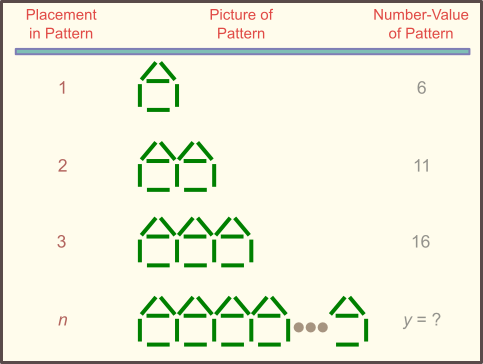 This pattern looks like a row of houses that gets longer and longer. 3. Each row adds five toothpicks in the shape of a house with no right wall, and there is always one extra toothpick at the far right edge to close the right-most house. The pattern is y = (5 × n) + 1. As before, we do not need the parenthesis because the order of operations already has us multiply before adding. But the parenthesis do help communicate where the pattern came from. Time for some area patterns. 4. How does the number of tiles in a square increase? Do we know this formula's name? 4. The pattern is y = n × n, which can also be written y = n2. This pattern is "tautological" because the formula does what its name says. The reason we call an exponent of two squaring a number because it makes a square whose side length is the number. 5. The area of a rectangle is equal to its length times its width. We cannot rediscover that whole formula with only one table. But we can find a specific version of it. 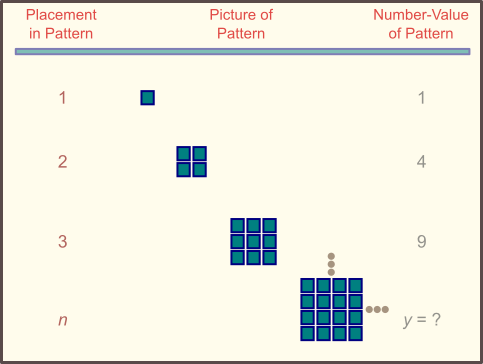 What is the pattern for these rectangular areas? 5. In this pattern the rectangles have sides of length n and (n + 1). The area formula multiplies these sides. Our answer is y = n × (n + 1). The formula A = l × w is also tautological. In our illustration is the second rectangle three rows of two tiles, or two columns of three tiles? Either way, making copies of an amount is simply what multiplcation does by definition. 6. How about a triangle of tiles? This pattern seems harder than the previous two! But there is a trick that makes it easy. You can find the trick by comparing this pattern to the rectangle pattern. 6. Notice that each triangle in this pattern is half the size of the corresponding rectangle in the previous pattern. 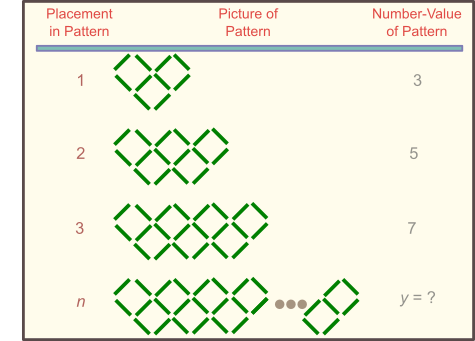 Since the previous pattern was y = n × (n + 1), we want half of that. We need to divide by two at the end. The formula we just found is called the Triangle Formula. Outside of a math classroom it is not as famous as the Square Formula or the Rectangle Area Formula. But it does deserve its own name because it is very useful. We just found the Triangle Formula. The triangle pattern goes 1, 3, 6, 10,... with each step increasing additively by one more than the previous step. The Triangle Formula appears surprisingly often in real-life applications. Here are a three pattern problems that seem tricky until you realize how the answer is made by tweaking the Triangle Formula. 7. This pattern involves how many toothpicks are in a triangle that grows downward. Each step in the pattern adds another row to the bottom of the previous triangle. 7. Each step in the pattern is three times as big as the Triangle Pattern. So we need to multiply by three at the end. The pattern is y = n × (n + 1) ÷ 2 × 3. 8. Each step in the pattern is four times as big as the Triangle Pattern. So we need to multiply by four at the end. If we divide by two and then multiply by four, the overall result is simply multiplying by two. Instead of ÷ 2 × 4 we can simply do × 2. The pattern is y = n × (n + 1) × 2. 9. What is the most number of pieces you can make with straight cuts on a pizza? You will have to cut messy and not have every cut go through the center! One cut must make 2 pieces. Two cuts cannot make more than four pieces. 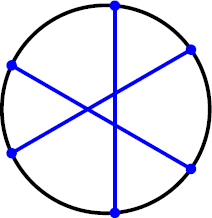 The picture below shows a way three cuts can make seven pieces. Four cuts can make eleven pieces! And so on. 9. 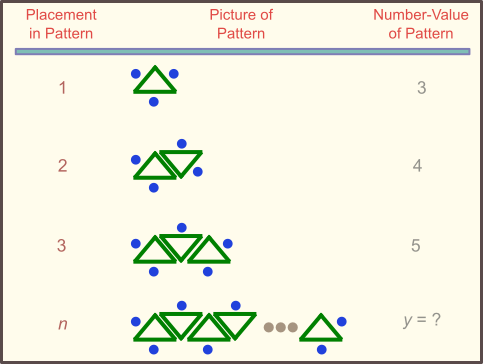 Each step in the pattern is one more than the Triangle Pattern. So we need to add one at the end. The pattern is y = n × (n + 1) ÷ 2 + 1. 10. Triangular tables are placed in a row to seat more people. One table has 3 seats. Two tables have 4 seats. Create a formula where we put in the number of tables (as n) and get out the number of seats (as y). 10. Each table has one person seated at either the top or bottom of the row. Then we always have an extra 2 people at the left and right sides of the row. So the formula is y = n + 2. 11. Now we switch to square tables. We still make a row of tables to seat more people. One table has 4 seats. Two tables have 6 seats. Create a formula where we put in the number of tables (as n) and get out the number of seats (as y). 11. Each table has two people seated at the top and bottom of the row. As before, we always have an extra 2 people at the left and right sides of the row. So the formula is y = 2n + 2. 12. Describe an in-class activity that would teach students about the tautological Cubic Formula y = n3. 12. For the pattern y = n3 the students could make big cubes of increasing size using sugar cubes (or small plastic cubes). The first is a single sugar cube. The second has four sugar cubes. The third looks like a Rubic's Cube puzzle with nine sugar cubes. And so on. 13. Describe an in-class activity that would teach students about the tautological Square Root Formula y = √n. 13. 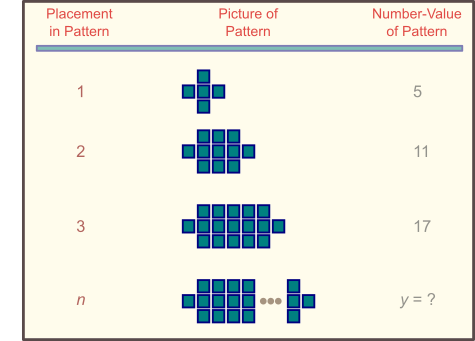 For the pattern y = √n the table's pictures would be squares just like in the Square Formula Table we saw in Example #4. However, the numbers in the first column would be the area of the square, which means that only the rows 1, 4, 9, 16,... would have a picture. (This is okay. Lots of blank table rows would show that most counting numbers do not have nice square roots.) The numbers in the third cloumn would be the edge length of the square. Here are Math 20 review problems about factors, and order of operations, and terms. Each time you load the page these problems change! These homework problems have no answers. First do the other homework for as much practice as you need. Once you have confidence, these problems can be turned in to be graded. 18. How about this extra-wide plus shape? 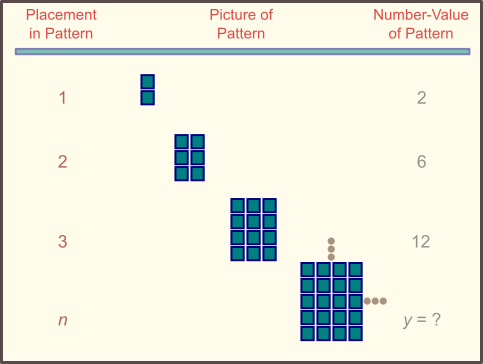 What is the pattern for how many squares are in each row? 19. This shape looks somewhat like the stand that holds up a road construction sign. With each step it gets longer in each direction. 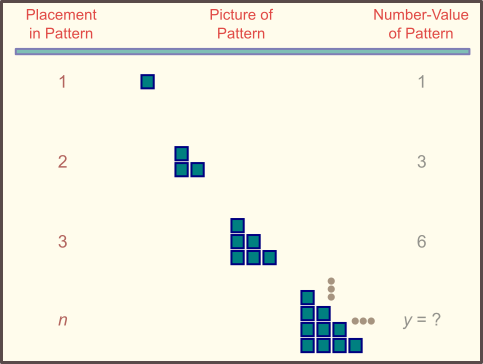 What is the pattern for how many cubes are in each row? 20. This next exercise is not really part of our class. You are encouraged to ponder and write out an answer, and even share it with a family member or friend. Use the same tables of eight perspectives to answer one of the questions Who are you? or perhaps Who are you as a student? 21. We have all seen how dust floats in the air. Each dust particle has weight and is pulled down by gravity—but the upward force of air resistance can be equally strong. Just like water strider bugs can walk on water because they do not weigh enough to sink through the surface tension of water they stand on, a dust particle can "stand" on the air below it. Your task is to use the chart below (or another chart similar to it) to explain why rain falls but clouds float.